In 2015, companies spent over $52 million dollars paying for work-related compensation for workplace fall injuries alone. Falls are the leading cause of fatal accidents in the Ontario construction industry. 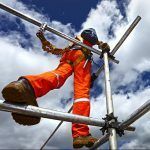 To help you reduce the risk of a workplace fall injury, we have created a list of the top 5 safety tips for working at heights. 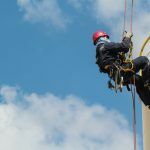 If you require a Personal Fall Arrest System (PFAS) to do your job, you need to ensure that you’re choosing the proper equipment for the type of work that you do. Not all PFAS are made the same. 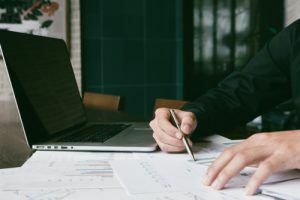 Although the prices may have quite a substantial difference, the brand name is not always the reason for the price increase. Some are made with better materials to be more fire-resistant like Kevlar. Depending on your working conditions you may need fireproof material, an arc-safe design or extra D-rings to remain safe, so always do your research and make sure you are getting the right PFSA for your working conditions and chose the best one for your job regardless of the price. Although using a Personal Fall Arrest System should prevent all falls there are issues with assuming it. A qualified member of the team should routinely check harnesses and lanyards to see if the wear and tear could cause the system to fail. This should be checked prior to every use. The inspection should be thorough but does not need to take a lot of time. Even so, this brief pre-work check could save a life. 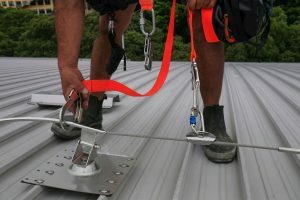 In order to reduce the odds of a workplace injury all workers who are performing work at heights should do regular training and make ensure all relevant licensing is up to date. It’s important that all workers performing work at heights are aware of the risks involved with the task. Always check the surfaces that your workers will be working on to ensure they are stable. There is a chance someone could get seriously injured if they do not use proper PFAS while working at heights with a fragile surface. Remember to consider all possible safety measures if exposure to unstable surfaces is present. 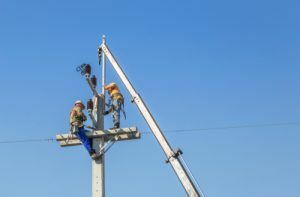 You must ensure employees are wearing proper safety equipment when working near these areas. There should be awareness made of the hazards and risks that are associated with the work being performed by conducting a risk assessment. You can identify hazards with risk assessments tools, analyzing the risks associated with that particular task to determine the next preventative measure to minimize the risks.